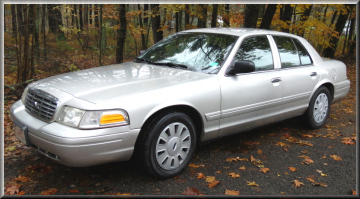 Crown Vics, ETC started in 2000 after I bought Vic 1.0, a 1998 Crown Victoria LX HPP. It was purchased on April 6th 2000 with 23,490 miles, and retired July 20, 2015 with 151,152 miles. Vic 2.0 was a 2006 P71 in Blue Pearl. This car was used by Ford as a demo vehicle, so it never saw police service. My boyfriend bought it 6/27/2007 with 13,129 miles. It became mine on July 20, 2015 with 161,584 miles. It was damaged (by someone else) and retired in September of 2018 with well over 186,000 miles. It was replaced in October 2018 by Vic 3.0, a 2008 P71 in Silver Birch with 120,971 miles. It currently has about 123,500. CrownVicsEtc.com does not condone police impersonation of any kind, and does not willingly post anything which may be related to an impersonator. Photos and information related to police cars contained within this site are provided purely for responsible use by the viewer. I decided to start a CVE Facebook page to gauge interest. You can see it HERE. Please don't forget OPERATION: VIC PIC!